Between the ocean and vineyards, in a superb landscape, the Chateau l’Hospitalet breathes wellbeing and the Mediterranean lifestyle. An essential destination during a wine tourism visit to the Languedoc! Just 15 km away from Narbonne, in the heart of the Narbonne regional park, the road first winds through a landscape of pine trees and vineyards before revealing a large plateau overlooking the Mediterranean Sea, where the vineyards are king. You are in the heart of the protected La Clape Mountains (the name means ‘pile of stones’ in the local Languedoc language), which shelter the Chateau l’Hospitalet. A short 10-minute walk along the hill and you are rewarded with an exceptional view over the vineyards, the sea, the beaches and … in the distance, the Pyrenees Mountains. An exceptional view over the grape wines, the sea, the beaches, and … in the distance, the Pyrenees Mountains. It’s hard to imagine that 20 centuries ago the city of Narbonne was a port, and this peninsula was ... an island! The grape vines had already decided that this spot would be their home. Since then, the Aude River has changed its bed. Situated next to the Mediterranean Sea, La Clape mountain range is a wine district made up of limestone blocks, and is ideal for growing Bourboulenc and Vermentino (white wines), and Syrah and Mourvèdre (red wines). 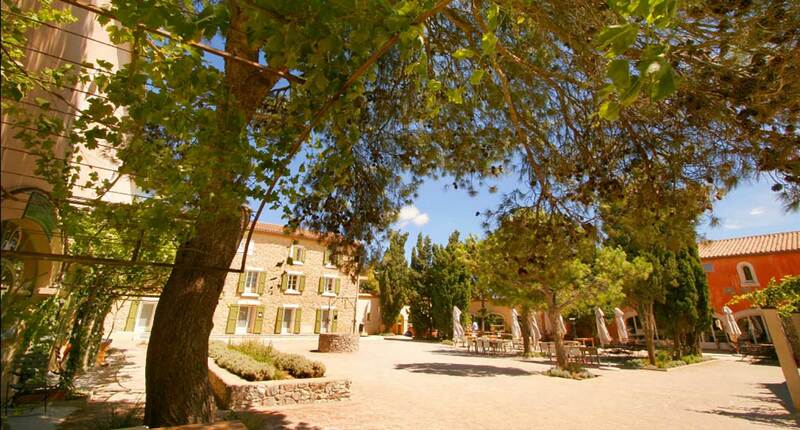 The Chateau l’Hospitalet is a traditional sixteenth-century building, and opens onto an inner courtyard. The surrounding vineyard is a real haven of peace in 1,000 hectares of pines, bushland and grape vines. In 2002, winemaker Gérard Bertrand took over this jewel of the southern wine region in order to maintain and promote the Mediterranean lifestyle by expanding the appreciation and experience of the great Languedoc wines. To preserve the environment, the vineyard became entirely organically cultivated: without the use of chemicals, the grape vines are grown in a way which protects natural biodiversity. During a relaxing stay in one of the hotel’s comfortable rooms, you will enjoy a magnificent view of the regional park. Each room has a special name which refers to wines from the south of France and reflects their individual character. At the restaurant, L’Art de Vivre, an inventive cuisine highlights the products of the Languedoc region, accompanied by Gérard Bertrand’s renowned grand cru wines. Here there is nothing but wellbeing and authenticity.